We’ll never know what happened: Had she strayed onto some burning embers? Sniffed out a barbecue pit? Wandered into a brush fire? None of them seemed likely for a squirrel living in New York City, and yet we couldn’t figure out how she had burned her nose and all four pads of her feet. 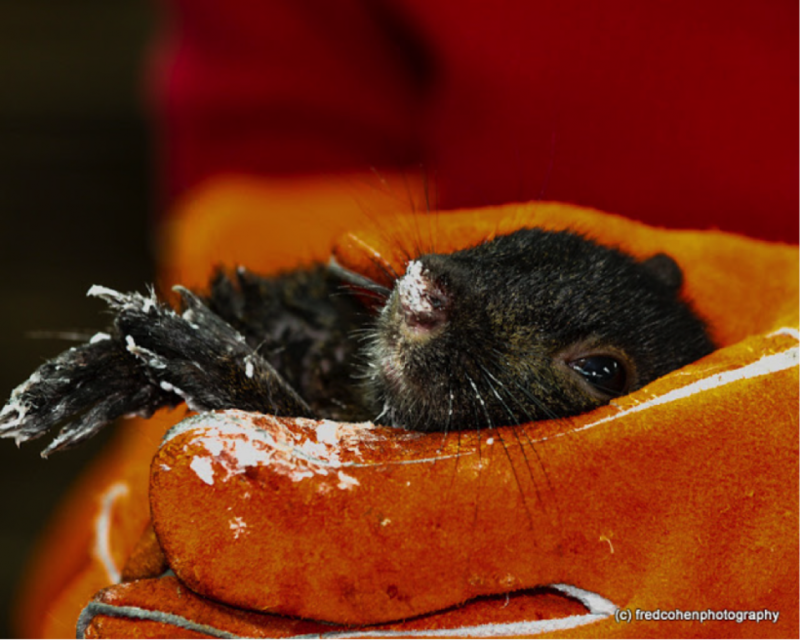 This little black squirrel was brought into the Wild Bird Fund Rehabilitation Center in Manhattan unable to walk or stand by a true squirrel-lover. Jason, her rescuer, has a business making squirrel-houses, and had brought her in for rehabilitation after finding her on the street. This type of injury is quite uncommon, and so is this squirrel. The vast majority of Eastern grey squirrels (Sciurus carolinensis ) are grey, or at least reddish-grey. As few as 1 in 10,000 squirrels are black. It is a type of melanism – the opposite of albinism – that produces dark-colored pigments and is found in a variety of animals including wolves, panthers, coral snakes and even moths. 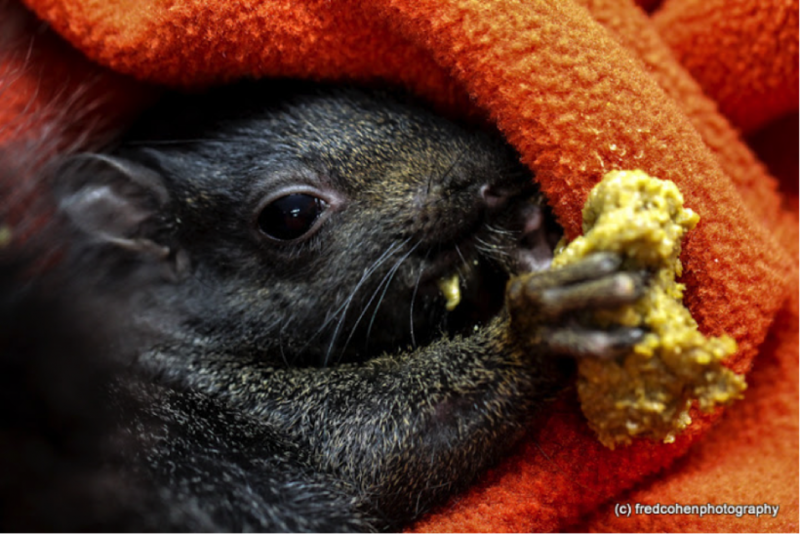 At the Wild Bird Fund the squirrel’s blistered pads and cut nose were medicated, and she was put on bed rest where she spent the next few days snuggling an orange blanket and eating an unending supply of squirrel pellets. Once her wounds were healed, Jason released her back to where she had been found. One of the hardest things about releasing our patients is never knowing how they are doing back in the wild. A few months after our black squirrel had been released however, we received a phone call from Jason with very exciting news: our patient had made a nest in one of his squirrel-houses. As he had watched her climb back into the house, he could also make out faint cries from deep inside the nest. Our squirrel had been doing just fine indeed – she was raising a family.